Here are some of the cards I've designed recently - this one is from the Poppystamps Blog. It combines dies from Poppystamps and Memory Box. They are perfect together, and the Memory Box cardstock in shades of Wisteria, Aloe, Violet and Thistle make it oh-so-easy to create a spring card. 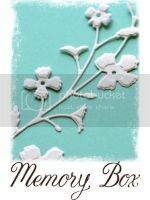 Memory Box and Poppystamps dies are great for cutting felt too - like these flowers, cut with the Memory Box Fabulous Phlox Die 98511. The card is posted on our Design Team Blog - view the details here. Here's a design that was embossed instead of diecut - for a crisp white-on-white look. Details are posted here on Outside the Box.